Then they made signs to his father to find out what he would like to name the child. 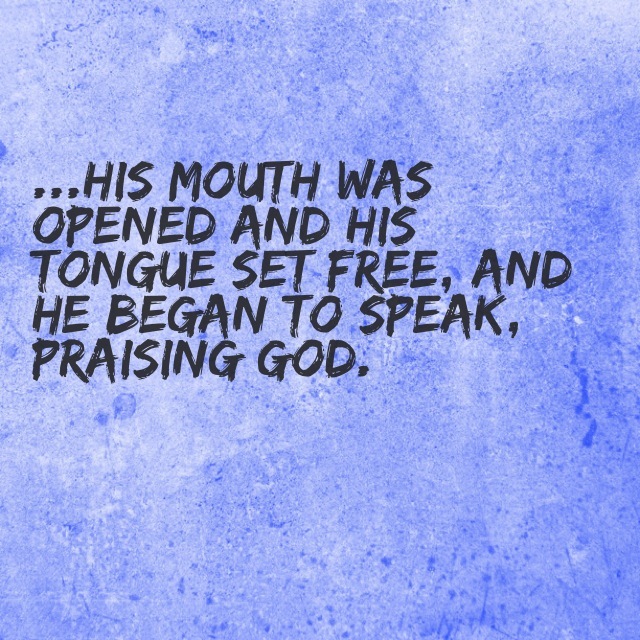 He asked for a writing tablet, and to everyone’s astonishment he wrote, “His name is John.” Immediately his mouth was opened and his tongue set free, and he began to speak, praising God. All the neighbors were filled with awe, and throughout the hill country of Judea people were talking about all these things. Everyone who heard this wondered about it, asking, “What then is this child going to be?” For the Lord’s hand was with him. Why do you think it was important that Zechariah and Elizabeth’s son be named John? In Luke 1:17 Zechariah was told that John would “bring back many of the people of Israel to the Lord their God” and “make ready a people prepared for the Lord.” How might understanding or seeing God’s grace make us ready to turn our hearts toward him? Can you identify the last time you were astonished or awed by an expression of God’s grace in your life? What was your response? Father, let me see your grace. Keep my heart ready and free my tongue to praise you. If you need to shut my mouth and make me silent, do it. If you need to bring me low or break my heart, do it, Lord. Do whatever it takes if I turn away from you. Prepare the way by your grace for my return.